I usually try to stay positive, but the last year or so I have found it quite difficult. Sometimes I just need a friend or a loved one to encourage me. That little positive bit of encouragement usually makes me smile and help me get back on track. I came across a wonderful company that sells items of encouragement... That’s why I’m loving Piece of the Puzzle Affirmative Jewelry by The Good Cheer Company. 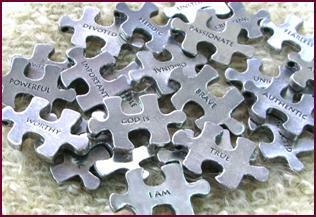 The Good Cheer Company offers various forms of their encouraging puzzle pieces. One side says, “I Am”, and the other side is engraved with your choice of 40 different sayings. The piece that they sent me says, "peace". It is a nice reminder for whenever I am having a stressful day, and I want to take it out on someone else. I can just look down at my puzzle "peace" necklace, and know everything will be alright. The puzzle pieces are offered in a variety of ways: loose (stick a magnet on the back and put it on your fridge), key chain attachment, elastic ID bracelet, leather adjustable necklace, ball chain necklace and a sterling silver chain necklace. The variety of ways they are offered make them appropriate for male or female, jewelry wearer or not. This would make for the perfect holiday gift! What are the positive, encouraging things that are options for the other side? I AM/ PERFECT HEALTH *NEW! Go ahead and visit The Good Cheer Company and find some Piece of the Puzzle Affirmative Jewelry that fits you, a relative or a friend. Encourage someone with your next gift. Also check out their gifts for pets and their encouraging CD mentioned by Ellen Degeneres. 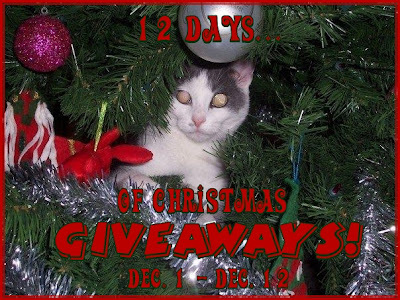 The Good Cheer Company has sponsored my '12 Days of Christmas Giveaways'! One lucky person will get the opportunity to win their very own item! "Win your own item from The Good Cheer Company @kimmie_1980 http://tinyurl.com/243fj3t (12/19) #giveaway"
The Good Cheer Company, is sponsoring my '12 Days of Christmas Giveaways' event, and offering a product to one of my readers. I did not receive any compensation or incentive nor was I required to write a positive review. Individual results or experiences may vary. I am Fierce is the one for me! I like the "I am devoted" puzzle piece.